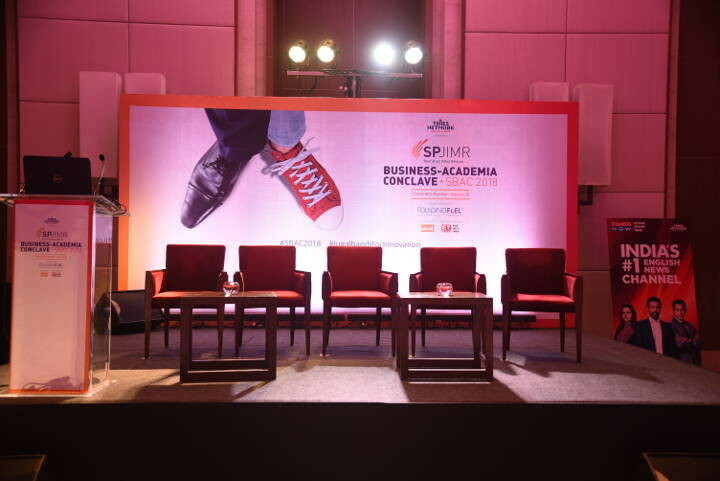 The stage was all set for an afternoon full of discussions, debates and insights from academics and practitioners. 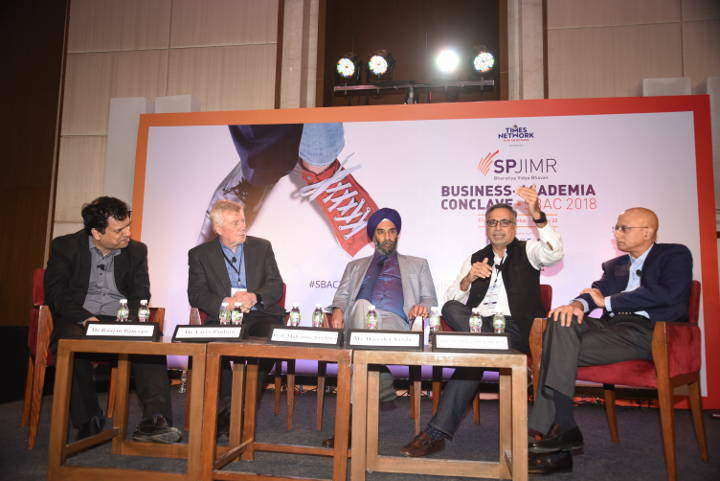 The background image—formal and sports shoe—turned out to be the perfect metaphor for the two worlds the large corporations and start-ups occupy, and gave a context for Jugalbandi for Innovation. SP Jain Institute of Management and Research (SPJIMR) Dean Dr Ranjan Banerjee sets the context for the conclave. 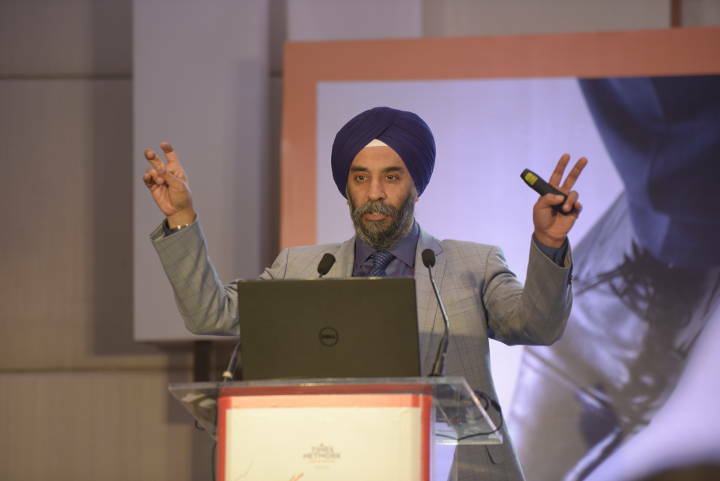 Prof Mohanbir Sawhney, McCormick Tribune Professor of Technology at the Kellogg School of Management, has not only been providing crucial advice to some of the largest corporations in the world, he has also been at the forefront of explaining the big changes in the world of technology and business. In his keynote address his focus was on innovation models. 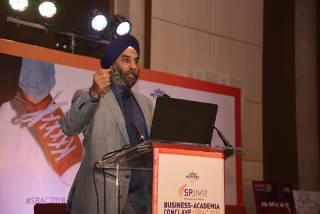 A packed hall with audience drawn from the world of big business, start-ups, and academia listen to Prof Mohanbir Sawhney. 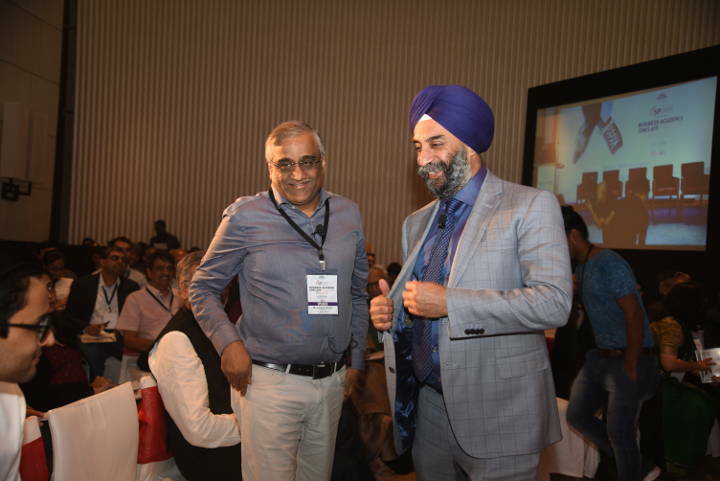 R Gopalakrishnan, executive-in-residence at SPJIMR and a senior corporate leader who led businesses at Hindustan Unilever and later served on the board of Tata Sons, having a lighter moment with Prof Sawhney during their tête-à-tête on innovation. How does one ‘transform the soul of an enterprise’? 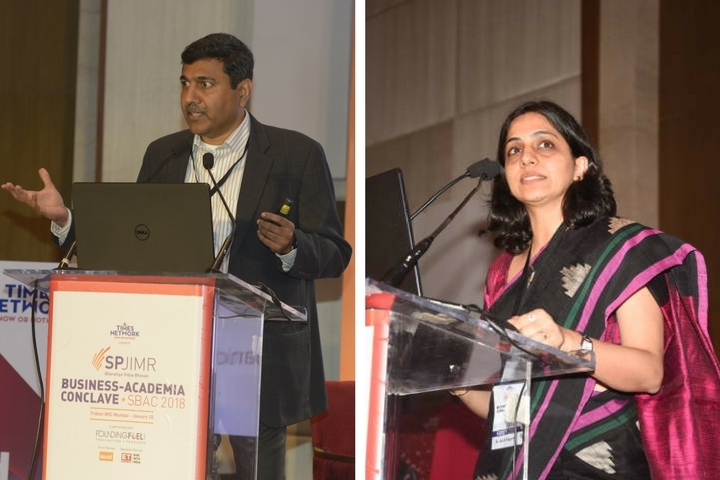 SBAC 2018 brought together four business leaders—united by the scale of their ambitions, but diverse in terms of their educational background and experience—who shared their learnings. From L to R: Indrajit Gupta, co-founder and director, Founding Fuel; Kishore Biyani, founder and group CEO, Future Group; Suresh Narayanan, chairman and managing director, Nestle India; Sanjay Gupta, MD, Star India; and Rahul Narayan, founder, TeamIndus. 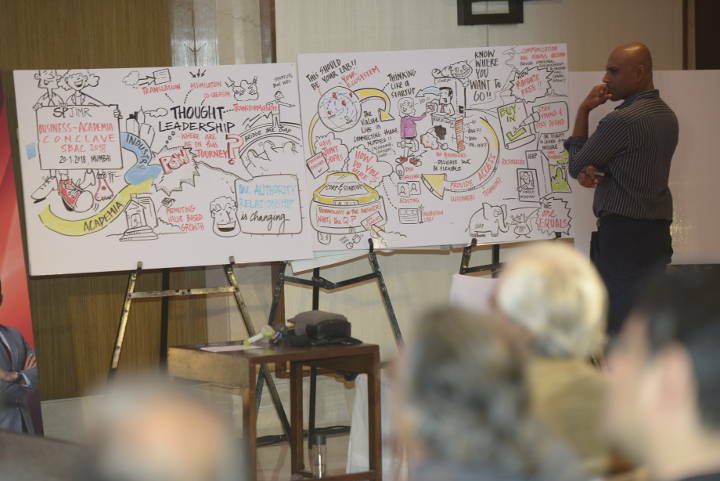 As the discussions went on stage, graphic artist Santosh Nair captured the key insights live on whiteboards next to the stage. 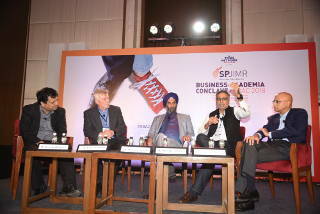 Anchored by SPJIMR dean Dr Ranjan Banerjee, panellists Larry Paulson, Vice President and President, Qualcomm India; Prof Mohanbir Sawhney, Kellogg School of Management; Haresh Chawla, Partner, True North; and Ananda Mukerji, Co-founder, Anunta Tech discuss how corporations and start-ups are partnering to drive the innovation agenda. Sanjay Purohit (standing), strategic advisor, EkStep Foundation and Madan Padaki, founder and CEO, 1Bridge, literally played jugalbandi on stage, with Purohit explaining the concept of societal platforms and Padaki giving examples from the ground, drawing from his own experience as a social entrepreneur. 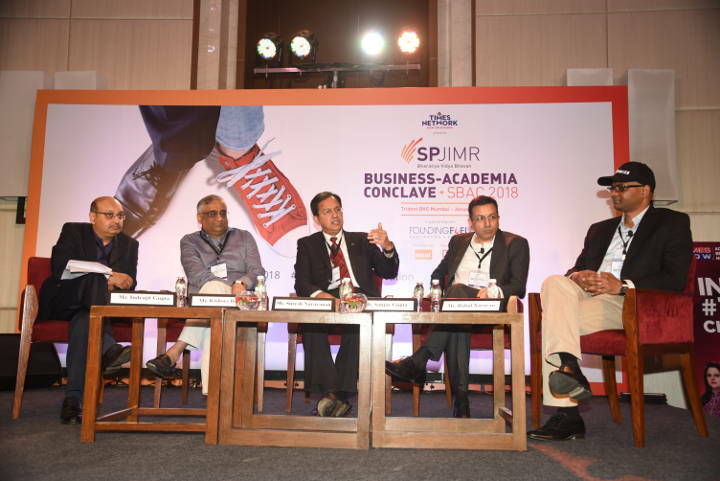 SPJIMR’s Start-up Incubation Centre has sparked more than 50 alumni ventures. The start-up booths at the venue showcased three of these and garnered a lot of interest from the speakers and delegates. An informal choupal chat on ‘Learning from Entrepreneurial Journeys’ with select alumni start-up founders, Prof Shirish Kotmire, head of the Start-Up Incubation Centre and anchored by Sonali Krishna of ET Now. 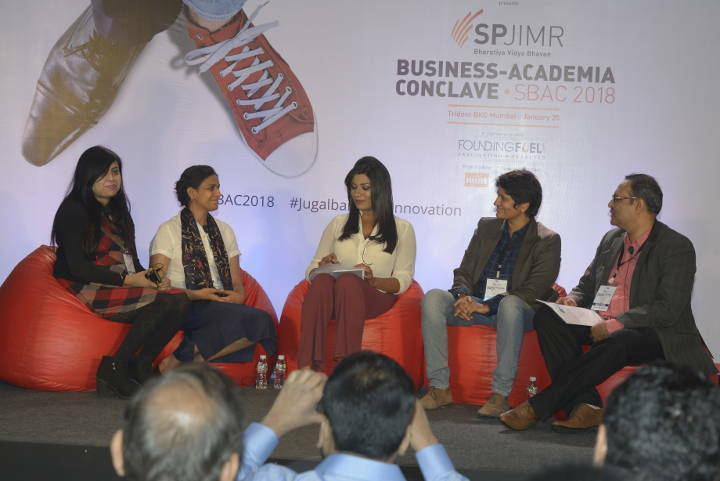 The start-up founders included Frapperz’ Rimjhim Ray (extreme left), Taru Naturals’ Ruchi Jain (second from left), and Zoctr’s Nidhi Saxena (second from right). 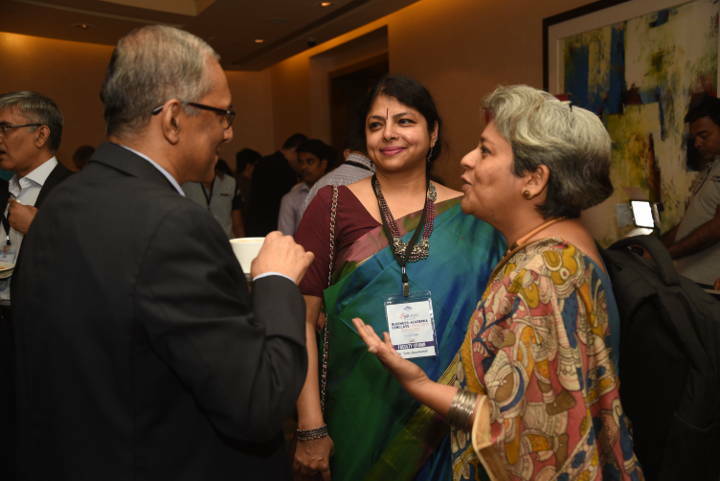 Dr. Ashita Aggarwal (right), professor of marketing at SPJIMR and CS Swaminathan, co-founder, Founding Fuel, presented a preview from an ongoing research on how companies ranging from Wipro to Mahindra are approaching innovation. 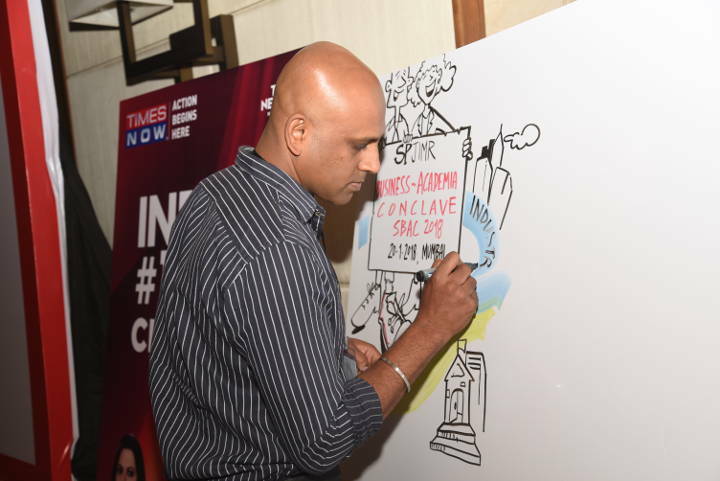 Santosh Nair’s visual interpretation of the ideas discussed was a huge hit among the audience, who were later seen capturing the images on their cellphones. 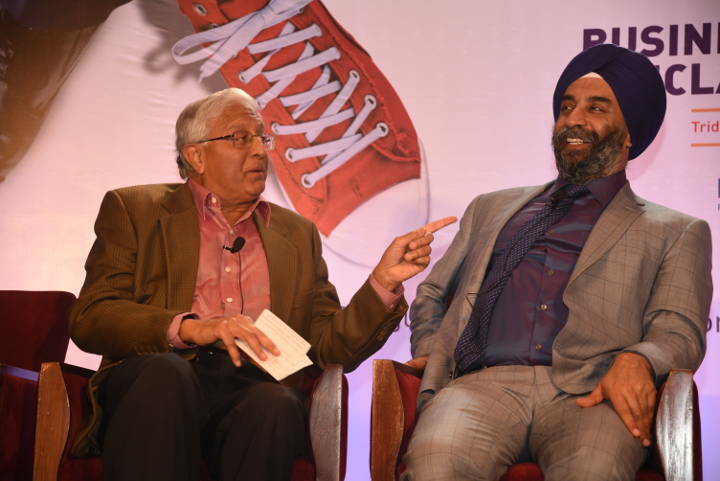 Future Group founder Kishore Biyani (left) and Prof Mohnabir Sawhney chat. From left: SPJIMR faculty Thomas Puliyel, Dr Tulsi Jayakumar, and Prof. Deepa Krishnan. The delegates, speakers and the faculty used the lunch and tea break to network and share their learnings from the session. 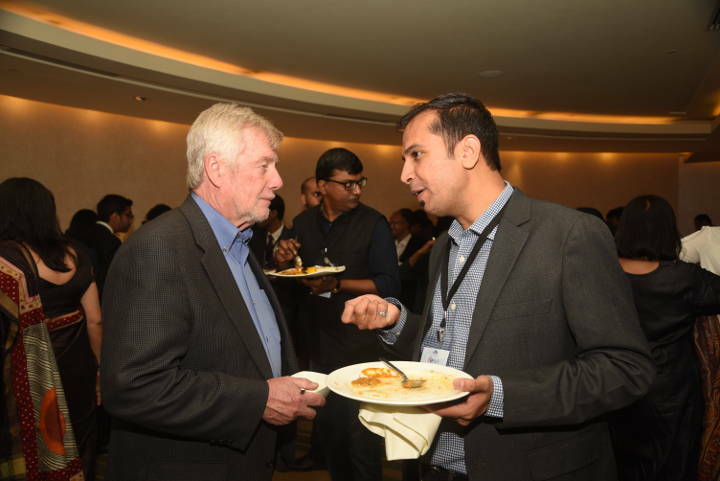 Qualcomm India president Larry Paulson (left) in conversation with his colleague Manoj Khilnani, director, marketing and communications. 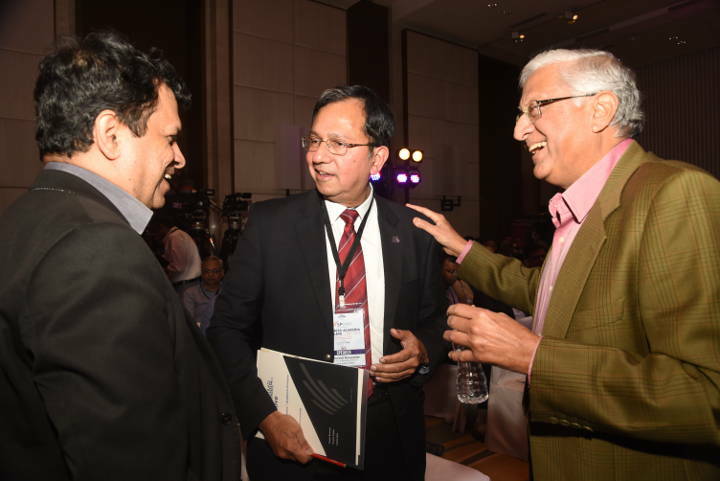 From left: SPJIMR dean Ranjan Banerjee, Nestle’s Suresh Narayanan, and senior corporate leader and SPJIMR executive-in-residence R Gopalakrishnan. 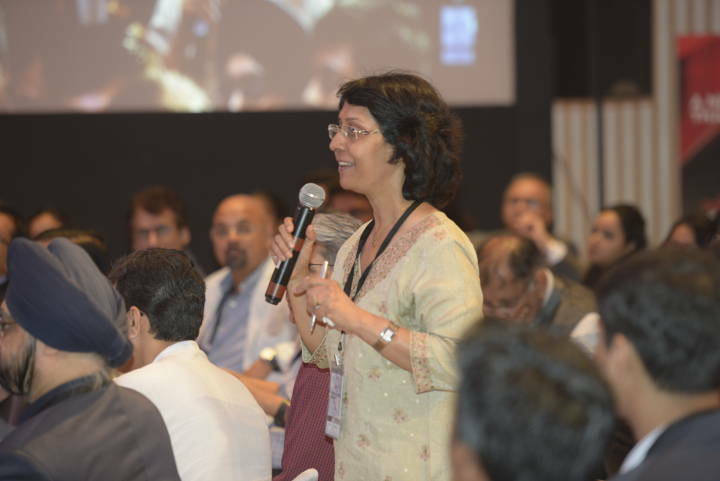 Anita Bhogle, co-founder of Bizpunditz, a digital learning content library, quizzes the panellists. 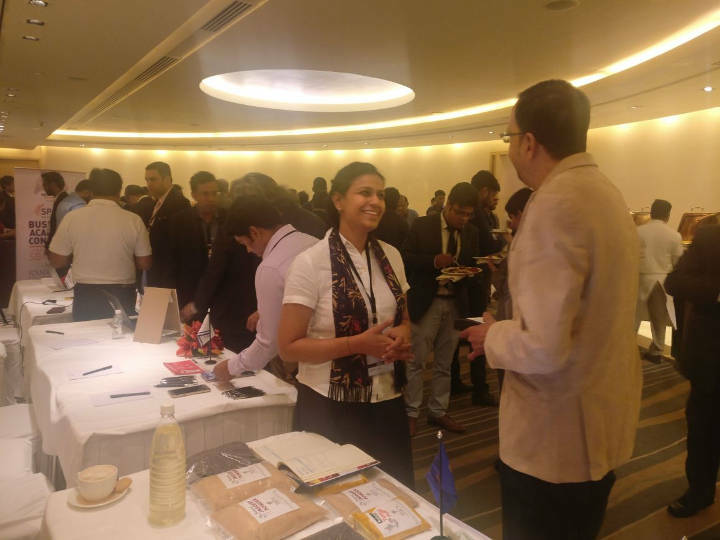 With the registrations far exceeding the number of seats, the composition of the audience was carefully made to keep a balance between entrepreneurs, executives, consultants and members of academia. How can established corporations engage with the start-up ecosystem to take Indian innovation to the next level? And what role can academia play in this? 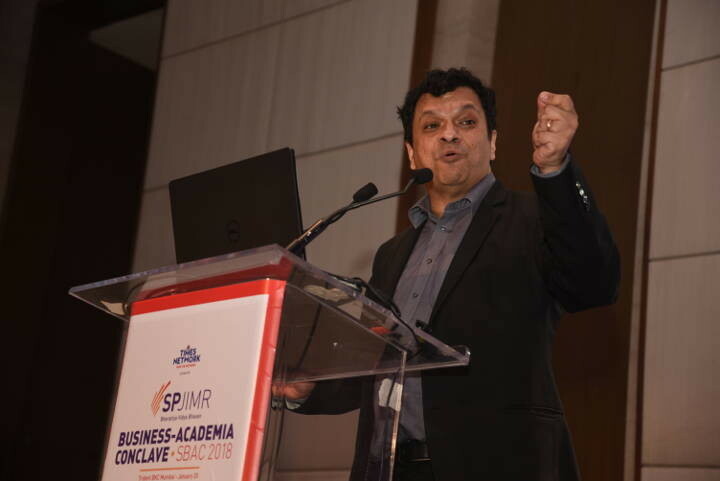 That was the theme of the 9th edition of the annual SPJIMR Business-Academia Conclave (SBAC2018), held on January 20 in Mumbai. 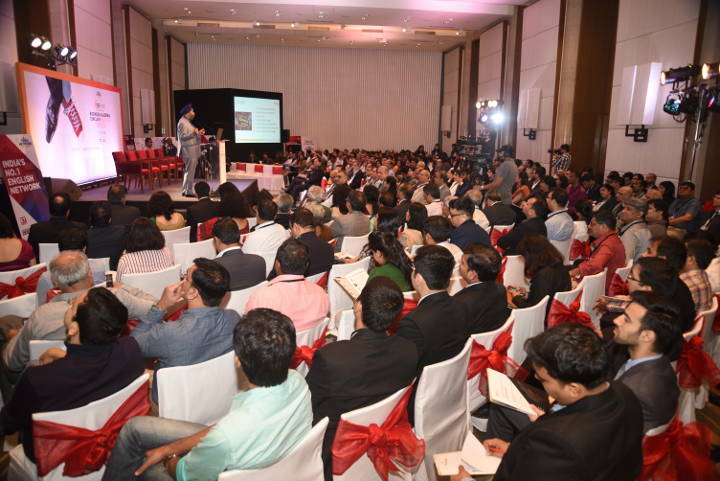 We bring you vignettes from an action packed day of debate, discussion and learnings.